The study to which this paper relates was funded by a grant from the Australian Research Council’s Linkages Program. The research team included researchers from Southern Cross University (SCU), the University of Technology Sydney (UTS), University of Southern Queensland (USQ) and Industry Partners Lutheran Community Care (LCC) and Baptist Community Services (BCS). An earlier developmental version of this paper was presented at the 12th EURAM conference, 6th–8th June, Rotterdam to seek feedback. 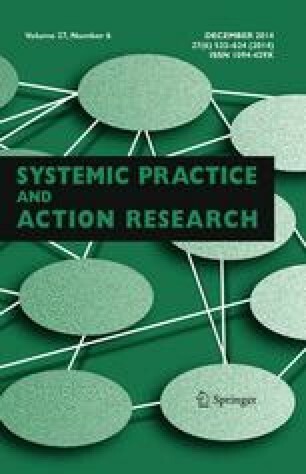 The authors thank the anonymous reviewers of the conference and Systemic Practice and Action Research for their valuable comments that has helped in improving this article. Permission has been obtained by EURAM to publish this paper in this journal. It is 1 July 2012. Following an extensive investigation of options for aged care reform and the development of a new industry blue-print by the Productivity Commission, the minority Federal Government developed legislation to enact the key components of the Commission’s findings. Allowing accommodation bonds for all Residential Aged Care and removal of the distinction between high and low care. The reverse mortgage proposal was labelled “A great big new death tax”. The demand for low care has been dropping because of the increased availability of in-the-home support. Not only are vacancy rates increasing but the amount held in accommodation bonds is reducing fairly rapidly. The availability of Community Care packages to address the rapidly growing and higher care needs of the ageing Australian community will remain constrained and unable to meet demand. The funding (both government and private) that would have enabled the payment of more competitive wages to care staff will not become available. Incidentally, a medium sized for-profit aged care provider in Victoria has recently appointed administrators because of trading difficulties. The administrators have declared the services to be unviable and are now seeking to sell the assets which include some services on valuable inner-city land. In 2011 the Productivity Commission released a detailed options paper for redesigning Australia’s aged care system to ensure it can meet the challenges facing it in the coming decades. Promotion of skills development of aged care workforce through expansion of courses to provide aged care workers at all levels with the skills they need. Increased subsidy for approved basic standard of residential care accommodation. As a leader in your organisation, you are responsible for guiding the organisation through this change process. The need for aged care recipients to contribute more to the cost of their care and accommodation (except supported residents). The abolition of accommodation bonds and their replacement by periodic payments. The reverse mortgage proposal was labelling “A great big new death tax”. It is increasingly uneconomic to build new high care beds or to replace or upgrade ageing buildings used for high care—services already lose more than $18 per day on average for every high care bed they have (with the exception of ‘extra services’ beds). Government funding has not kept up with increases in costs, especially labour and energy costs, for many years and more than 70 % of services nationally are now operating in deficit. You are part of the executive management team of a medium sized faith-based aged care provider in Queensland. How will you respond to the circumstances in which the industry now finds itself?